Chocolate avocado muffins that are dairy free/gluten free and perfect for a healthy breakfast treat or afternoon snack. I wanted to create something a little similar [using somewhat the same ingredients] but something you can enjoy for breakfast or a quick afternoon snack that is low in sugar, good for you, but still tastes amazingly chocolate-y! So, today I am sharing with you these chocolate avocado muffins, that are completely dairy free and gluten free! They aren’t overly sweet taste, crispy on the edges, soft in the center, and taste like a brownie! They have a base of almond flour, cacao powder, and avocado! I love baking with avocados because of the higher water content they have; your muffins, breads, and/or cookies will come out a bit softer, a little chewier, and a little less crumbly than if you were to use butter! Plus, you won’t taste them at all with the addition of all the other ingredients! The recipe will give you about 7-8 small muffins that can be stored in the fridge for up to a week but you can always store them in the freezer to last longer! I usually do that with 3 or 4 so I can always have a few on hand when I crave one! Just reheat them back in the oven and slab some nut butter on them and they will be the perfect warm afternoon treat or breakfast! I haven’t tested any other flours in this recipe so I suggest to try and stick to the recipe or experiment at your own risk, knowing that the texture/taste will turn out differently. Normally when I sub a flax egg for an egg it always works, but I did not try it out this time! You can however sub the honey for maple syrup or any other liquid sweetener you love! Hope you enjoy! 1. Preheat oven to 350 degrees and spray a muffin tin with cooking spray. 2. In a blender or use a hand mixer; add in all of the ingredients except the chocolate chips. 4. Scoop about 1/4 cup of the mixture into the muffin tins. 5. Bake at 350 degrees for about 20 minutes. Stick a knife in the middle and if it comes out clean, they are done! Don’t over bake them! They will come out dry and become drier as the time passes. Better to undercook them slightly! Store in an airtight container for up to 1 week in fridge or freezer for longer! Egg and toast tartlets for a quick breakfast on the go or for a weekend brunch! I pretty much eat eggs and toast every single day; always with avocado. I am a creature of habit when it comes to breakfast during the week and even on the weekends if I go out to a cafe. It is simple, quick to make, and always filling. I wanted to change it up slightly with how I normally make breakfast, so I decided to make these little egg and toast tartlets! I promise you they are simple to put together and great for breakfast on the go during the week (can be kept in the fridge for a few days) or for a weekend brunch! I filled each cup with sautéed brussels sprouts, but you can do anything yo would like- spinach, sundried tomatoes, kale, chopped sweet potatoes, onions, or leave them completely plain! For the bread, I used sprouted seed bread, but any will work but preferably shaped like your traditional bread as it will make it easier to slice off the crusts and press them into the muffin tin! I lined the muffin tin with a square of parchment paper (see above), sprayed with avocado oil (use whatever you have!) so it would be easier to remove the bread muffin cups. I have not tried it without using parchment paper, but I would assume that if you generously sprayed each cup with oil- you will be good to go! After I sliced the crust off of the bread, I flatted it out with a spatula. A rolling pin would work better, but I didn’t have one! Next, I pressed the bread into each up and lightly sprayed with the avocado oil again. Then, you bake in the oven for about 5-7 minutes. While the bread was getting crispy in the oven, I sautéed about 1/2 cup of shaved brussels sprouts and got 4 eggs from the fridge. Once the bread was crispy, I filled them with the brussels sprouts, cracked the egg in each cup and let them bake in the oven for about 15-18 minutes. The time will depend on how you like your eggs- fully cooked through, runny, or somewhere in between! Sprinkled each with sea salt, pepper, and red pepper flakes! It is best if you eat them right away, but I saved the others in the fridge once they completely cooled to have for the next day! You can eat them cold or simply reheat them in the oven for a few minutes. cut your parchment paper into squares and line your muffin tin with the squares. Cut the crusts off of the bread. Flatted with a spatula or a rolling pin. Press each slice of bread into the muffin tins and spray with cooking spray. Cook in the oven at 375 degrees for about 5-7 minutes. Prepare your vegetables, cook them on the stove. Once the bread is crispy, add the vegetables into each cup. Crack your egg into each one. Bake in the oven again at 375 for about 15-18 minutes. Depending on how you prefer your eggs. When they are finished, sprinkle with sea salt, pepper, and red pepper flakes. Serve! For leftovers, store in an airtight container once they are completely cool. To reheat place in the oven for a few minutes until warm. 350 degrees for about 15 minutes or until the bread is crispy. Moist almond flour scones that are lightly sweetened with honey and topped with crushed walnuts, cinnamon, and coconut sugar. 100% dairy free and gluten free. Scones are one of my favorite breakfast pastries but always have a hard time ordering them at a cafe because normally they are made with real (non-dairy) butter or even buttermilk and then, even if they are completely vegan they are dry; SO DRY. Not the good crumbly kind of dry, but the kind that just gets stuck to the roof of your mouth and tastes like flour. These, came out so moist/dough like in the middle, crispy on top and the edges, and are seriously delicious plus easy to make! I have made these before but changed around the recipe this time because I wanted to use “healthier” ingredients and a bit less sweetener. For these cinnamon sugar scones, I used almond flour as the base, eggs, almond milk, dairy free butter, and only sweetened them with 1 tbsp. of maple syrup along with the sprinkle of coconut sugar on top! They are not overly sweet (which I prefer) and have a slight nutty taste (from the added walnuts in the dough and the almond flour). I do have to say that the cinnamon sugar crumble on top is 100% necessary because it adds more texture, a touch of sweetness (that you can control) and honestly who doesn’t love cinnamon and sugar! I promise you these are simple to make and even if you haven’t made scones before, don’t let it intimidate you! They just require a bit of time (but still less than 45 minutes) and you have a total of 8 scones to snack on for the week. Tip; you can always freeze the dough, pre cut into scone like shapes, place it in the freezer for up to a month, and then bake them in the oven after they have thawed a bit for fresh scones whenever you like! I also love that this base is pretty versatile too. I decided to add in chopped walnuts and cinnamon along with the coconut sugar, melted butter, and additional cinnamon on top because they remind me of my mom’s cinnamon sugar coffee cake which I am OBSESSED with, but you can add in blueberries, chocolate chips, or chopped dates! If you do not have maple syrup you can also sub in honey, it will just change the taste a bit. I have not tried any other subs with the flour nor tried using chia eggs or replacing the non-dairy butter with coconut oil. But, I am sure that all the ingredients listed below you won’t waste and can use over and over again in other recipes! You do need to let the dough chill for at least 15 minutes in the fridge, but while it is, you can prepare the topping, get the oven heated and set up your station with flour to flatted out the dough to make the scones! From start to finish it will take about 45 minutes! I hope you enjoy! I love them with my morning coffee or in the afternoon with a little melted butter or with greek yogurt! In your food processor add the almond flour, sea salt, and baking soda. Pulse once. Add the 2 tbsp. of cold butter into the food processor with the mixture above. Pulse about 10-15 times until the butter is crumbled. Set aside. In a large bowl add the eggs, vanilla, almond milk, and maple syrup. Mix until combined. Add the dry ingredients to the wet ingredients. Mix until combined. Add 1/2 tbsp. cinnamon to dough AND 1/4 cup of chopped walnuts. You can always add in more walnuts too and any addition add ins you are using here. Fold gently. Let dough chill in fridge for at least 15 minutes. Preheat oven to 350 degrees and line a baking sheet with parchment paper. Set aside. In a small bowl, add the remaining chopped walnuts, about 1-2 tbsp. coconut sugar, and 1 tbsp. of cinnamon. Adjust this! If you want more of any, please add. In a sauce pan, melted 1 tbsp. of non dairy butter OR 1 tbsp. of coconut oil (to use to brush the scones). After 15 minutes, take the dough out of the fridge. On your counter top, add a dusting of flour or almond flour. Roll your dough into a ball and then place on counter top to form into about 1 inch thick square. Cut in half and then half again. Then cut each half so you have 8 scones. See photo. Brush with either the butter or the coconut oil. Add the cinnamon coconut sugar walnut mixture on top. Bake in the oven at 350 degrees for about 16-20 minutes. The top/edges should start to brown and become crispy. Once they have completely cooled store the leftovers in the fridge for up to a week or you can free for longer and reheat whenever! I have not tested any other flours. I have not tested a chia egg or subbing the 2 tbsp. of butter with coconut oil. Chocolate-y baked oatmeal for one that tastes like you are eating cake for breakfast! Gluten free & dairy free made in 20 minutes. One of the reasons that I love baked oatmeal is once you have everything mixed together you can pop it in the oven and get ready for work, take a shower, or even get in a quick at home workout. It takes about 20 to 25 minutes to bake, but it really simple to make. Another thing; is that you can make any different flavor combinations once you have the base- fruity, savory, sweet- anything! For this one I did chocolate peanut butter and I swear it tastes like I am eating a chocolate cake for breakfast. It was full of chocolate, a little sweet, crunchy on the outside and warm/gooey in the middle. I made this chocolate peanut butter baked oatmeal the other day for breakfast after coming back from spending the weekend in Maine. Despite it raining all day on Saturday, the weather was crispy, refreshing, and the temperatures were much colder than here in BOS. That Monday morning after a hot yoga class I wanted something warm and comforting, but healthy! I came back from yoga, mixed everything in a bowl, transferred it to a greased (with coconut oil) ramekin and let it bake for 25 minutes. In the meantime, I made my boyfriend breakfast, took a shower, and finished getting ready for a full day of recipes and blog work. If you are looking to save a few minutes, you can always mix everything together the night before, minus the milk, and in the morning mix it with milk of choice then bake! honestly, look how delicious that looks! I topped mine with peanut butter, chia seeds, a big scoop of dairy free greek yogurt, chopped walnuts, and cacao nibs! You can do any toppings you like; sliced bananas, granola, chocolate chips, honey, or maple syrup! The base of the baked oatmeal is; gluten free rolled oats, chia seeds, almond milk, and a touch of baking soda (optional, but helps the oatmeal rise a bit). That is it; then you add whatever it is you are in the mood for…. sweetener of choice, if needed. optional add ins: 1 tbsp. or 1 scoop protein powder, sweetener of choice (1 tbsp), 1 tbsp. peanut butter or any nut/seed butter, sliced banana, 1 tbsp. coconut oil. Pre-heat your oven to 400 degrees. Lightly grease a ramekin or any oven safe dish with coconut oil or olive oil. Mix ALL the ingredients about in a bowl. If it seems to dry add in a bit more almond milk. I started off with 3/4 up, but then ended with 1 cup in total. Pour the mixture into the ramekin. Bake at 400 degrees for about 20-25 minutes. I checked after 20 minutes- the center was moist and the edges were crispy. I let it bake for another 5 minutes. Top with any toppings of choice. Eat out of the ramekin or allow it to cool slightly then flip it over on to a plate; it should come out pretty easily. A creamy, decadent gut healing hot chocolate that you will want to make all winter long to keep you warm and cozy. Ok, I am super excited about this recipe. It is a simple one yes, but it just tastes SO SO delicious. 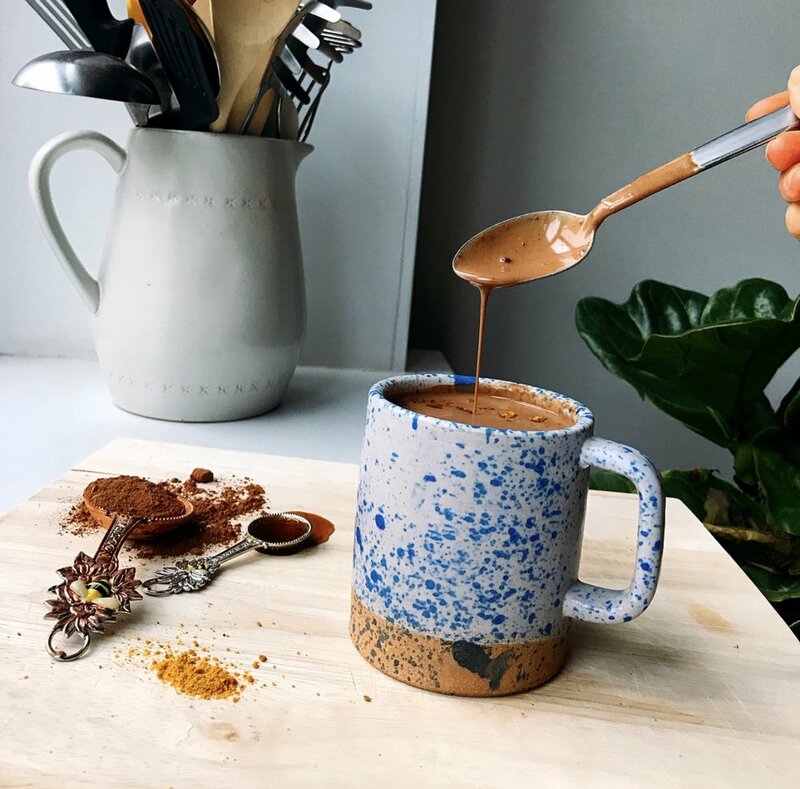 This hot chocolate is creamy, smooth, thick, warms you from the inside out and also; it is good for your gut. This chocolate-y drink is filled with raw cacao, a mix between canned coconut milk and almond milk, collagen, and just a few other things. I used canned coconut milk because it provides not only healthy fats, but it makes the drink extra creamy and thick. This recipe can be completely adaptable to your preference as well; extra spices, less or more sweetener, coconut milk or water instead of almond milk etc! First, I used my usual Marine Collagen from Vital Proteins. Not only has this improved the strength of my hair, the “plumpness” of my skin, but it has also helped tremendously with restoring my problematic gut health. As you know, I have suffered from leaky gut, SIBO, and many digestive issues and I truly feel that the Marine Collagen has helped restore the my gut lining, making it easier for me to properly digest food and overall just feel better (less bloat!). I love that it also adds in about 9 grams of protein into the drink (or anything you are consuming), it is tasteless, and you can mix it in just about anything- raw, baked, hot or cold! Just look how good that looks? Cinnamon; helps stabilize your blood sugar levels, adds in a touch of sweetness, it is anti-inflammatory and helps with blood circulation. Coconut; provides your body with healthy fats, anti-bacterial, helps keep you fuller for longer reducing your hunger, and can help improve bacteria and gut health by destroying harmful bacteria and things like candida. Turmeric; we should all know the benefits of this by now, but it can help detoxify your live, anti-inflammatory, and can help with your stomach lining. Ginger; I love ginger to help ease any stomach discomfort, pain, and digestion. Raw Cacao; (no sugar!) antioxidants, can help increase your energy/mood, help with PMS symptoms, filled with magnesium, and more! Raw Honey; antibacterial, a good source of antioxidants, and can help soothe digestive issues! This is just to name a few of what each add in can do for you, but there are benefits beyond this! For this recipe, I did only use 1/2 cup of canned coconut milk. So, you will have some left over but it is worth buying! If you are unsure as to what to do with the remaining coconut milk, you can store it in the fridge and use it the next day to make another drink. It will last up to 5 days in the fridge! I also have a recipe on my blog for a sweet potato coconut curry which you can use it for. You can freeze the canned coconut milk in ice cube trays and add them into your smoothies. I LOVE adding canned coconut milk into rice. Cook the rice as you normally would with about 1/4 cup to 1/2 cup canned coconut milk. It will be slightly sweeter and creamier. It is really endless. You will not have to waste it! In a small saucepan, add the above ingredients. Let it simmer for about 10 minutes on medium heat. Once it is to your temperature preference, pour! Top with cinnamon, chocolate shavings, or raw cacao powder. When I lived in Spain during the summers between my college years and then one more time again while I was receiving my Master’s Degree; in Spanish- I used to eat these Spanish omelettes or Spanish Tortillas every single day! The majority of the times that I lived there, it was with families and this seemed to be a staple in their diet. The mom, would make one for everyone to either snack on or have for breakfast and I always remember it left out on the counter top. The ingredients are pretty simple; usually just eggs, crispy potatoes, and maybe an onion. I personally love to eat them cold, but you can serve it warm too. What I love about it now is that it is very convenient for meal prep, a healthy filling breakfast, quick dinner and you can (if you want) add in vegetables of choice. For this recipe below, I kept it very basic and to the original, but feel free to add in chopped veggies or any spices you like. You can also use a sweet potato instead of a russet one, but I would suggest using a Japanese yam or one that is a bit firmer like that of a russet. I have made it before using a sweet potato (orange in color) and it was a bit soggy, but still good! Once you have cooked your sliced potato in a cast iron pan or non stick skillet until they are super crispy, you add in your eggs, spices and allow it to continue to cook until it becomes fluffy. Normally, I will let it continue to cook in the oven for the last 5-10 minutes because I haven’t mastered the art of flipping the omelet to ensure even cooking! It is really up to you! If you are planning to add in vegetables as well, make sure they are somewhat pre-cooked or add to the pan at the same time as the potatoes. It makes a really great breakfast as is, or for lunch/dinner with a side salad. It lasts up to 4-5 days in the fridge! optional: add in any spices of preference or measure to your liking. Heat a non stick skillet or cast iron pan with 2-3 tbsp olive oil or coconut oil on medium high heat. Add in the sliced potato and cook until tender, crispy, and start to brown. Add in the chopped onion and cook until fragrant. This should take about 10 minutes or so. Before adding the eggs into the pan, make sure the potatoes are evenly spread in the pan. Pour the eggs over the potatoes. Move the egg mixture and potatoes around every so often to ensure even cooking. Let it sit on top of the stove for about 5-8 minutes. You have TWO options here, you can either place the cast iron pan into the oven at 400 degrees and allow to finish cooking for 10 minutes OR remove the pan from the heat, carefully place a plate on top of the pan and flip the omelette, then gently slide the omelette back into the pan and allow to cook until completely cooked through. To remove, slide the omelette off the pan or cut straight from! Serve warm or cold! Keep in fridge for up to 5 days. Crispy french toast sticks drizzled with maple almond butter, chia seeds, & bee pollen for a breakfast or brunch in less than 10 minutes! Remember french toast sticks as a little kid? I loved the Kellogg’s Eggo French Toast sticks because they were so easy to pop in the toaster then dip them in an unforgivable amount of maple syrup. Honestly, I am now afraid to actually look at the ingredients…I think it is safe to safe that it has over 20 ingredients and these, the homemade ones; have just gluten free bread cut into sticks mixed with a wet batter of eggs, almond milk & cinnamon. That is it! To add in protein, healthy fats, and cut back on the sugar; I used RX Bars Maple Almond Butter, instead of maple syrup or butter on top. Their new maple almond butter packet has 9 grams of protein, 4 grams of sugars (from dates!) and tastes like fall in a package! It is really smooth and truthfully tastes just like maple syrup! I love almond butter because it is rich in slow-to-digest nutrients that keep your blood sugar levels stable and make you feel fuller longer and gives you a boost of energy! Their almond butter is smooth, easy to spread, contains egg whites for added protein, healthy fats (from the nuts), dates for fiber and natural sweetness, and still tastes delicious. are fun to make and simple! I kept the egg wash batter simple (almond milk, egg, cinnamon) but you can also add in a scoop of your favorite protein, sea salt, vanilla extract, or really anything else! You can also sub almond milk for your favorite nut milk or coconut milk. Once you cut the bread into slices, dip them in the batter, all you have to do is cook them in a cast iron pan on each side for a few minutes in coconut oil! This makes a really fun breakfast for little kids, a healthy brunch option, or a quick breakfast before work! Total time: less than 15 or so minutes. optional: cacao nibs, coconut flakes, hemp seeds, bee pollen. In a non stick pan or cast iron, add in 2 tbsp. of coconut oil on medium high heat. While the coconut oil is melting, in a small bowl whisk together the almond milk, cinnamon, 1 egg. Slice your bread into sticks; you will get 6 slices. Dip the bread sticks into the egg batter; make sure it is coated on both sides. Carefully place the bread sticks into the cast iron pan on medium heat. Allow to cook roughly 3-4 minutes on EACH side. Serve warm with your favorite toppings! Also, RX Bars has been kind to give me a code for you all to receive 20% off your order + free shipping! Click here and use the code BLAIR20. super simple blueberry chocolate chip pancakes that are dairy and gluten free! Crispy edges, packed with feel good ingredients, and taste delicious! I am one of those types of people that enjoys breakfast at any time of the day besides at "breakfast time." My morning cravings are always for smoothies or big messy yogurt bowls but I love having breakfast for dinner! Normally if I eat waffles, pancakes, or pastries for breakfast I feel pretty sluggish the rest of the day, too full, so I tend to not necessarily crave them first thing when I wake up...but these pancakes won't make you feel that way at all- they are made with good for you ingredients, are dairy free and gluten free! In less than 20 minutes you can have yourself a stack of chocolate chip blueberry pancakes that are fluffy, crispy on the edges, and since I used a banana as one of the ingredients, they slightly remind me of banana bread with a cake like texture. Overall I just felt better and try to sneak it into as many things as I can. Since you can't taste it, it makes it pretty easy to do so. This recipe calls for gluten free oats, a banana, eggs, baking powder, flax, vanilla, cinnamon, and the collagen! I have a recipe on my blog for 2 ingredient banana pancakes but recently I have found that they aren't as easy to flip or stay together like these do - the addition of the other ingredients keeps them together and makes them super fluffy! I added in blueberries and chocolate chips, but you can add in anything you want to keep them plain! I like to top pancakes with either coconut butter or melted nut butter, but obviously maple syrup will work! You can also make these ahead of time, freeze them and then when you are ready to eat pop them in your toaster oven or just heat in the oven for a few minutes. If you aren't freezing the pancakes they will last up to 4 days in the fridge! 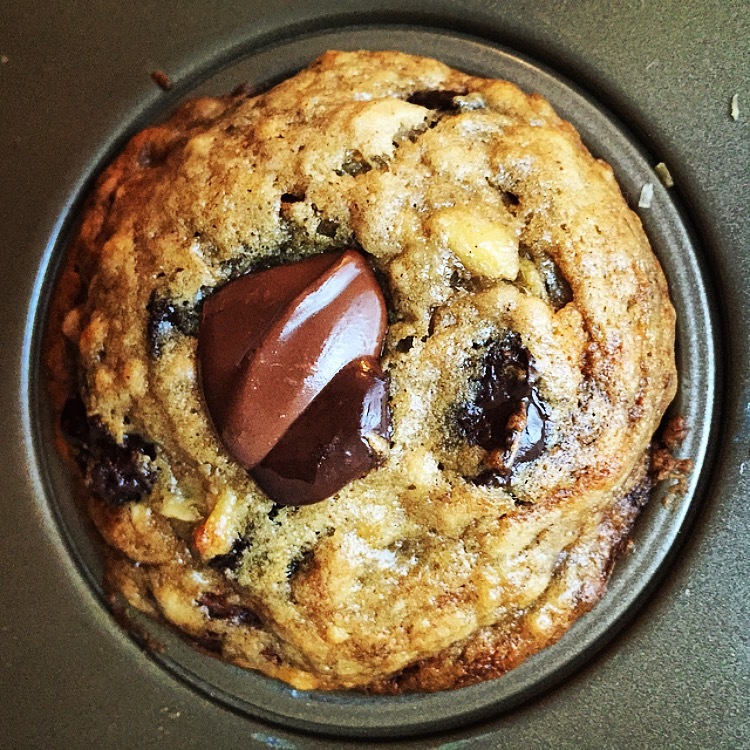 Additional add ins: chocolate chips, blueberries, bananas, nuts, etc! 1. Add ALL of the ingredients, except for the "additional add ins" into your blender. Blend until fully incorporated on medium speed. 3-5 minutes. 2. Over medium heat on a non stick skillet, add 1-2 tbsp. of coconut oil. Allow the pan to heat for a few minutes. 3. Pour about 1/4 cup heaping size into the skillet. After 4 minutes, the edges should begin to crips and bubbles will form. FLIP and ADD your toppings of choice and let the pancakes cook for an addition 3-4 minutes. 4. Serve warm or cold with maple syrup, nut butters, coconut butter, extra berries, few dashes of cinnamon or anything you like! 1. You can make the pancakes any size you want, the larger the size the longer you will cook on each side. 2. Store the remaining pancakes in an air tight container in the fridge for up to 4 days or in the freezer for longer. To re-heat simply place in your toast oven or in the oven until warm. 3. You do not have to use gluten free oats, regular oats will work fine! I haven't tested any other flours etc. 4. I used a yellow/firm banana, but if the banana is very ripe the pancakes will be sweeter. You can always add in a sweetener of choice, but not necessary. 5. The marine collagen is optional and can be left out, just simply adds extra nutritional benefits. If you do leave it out it does not need to be replaced with a substitute. 6. You can also add in protein powder. I would suggest 2 scoops of your favorite brand/flavor! A super moist vegan blueberry bread perfect for snacking or breakfast! All week I have been wanting to make a blueberry bread; probably because I have so many blueberries in my fridge for my morning smoothies and I needed to use a few before they turned bad! I didn't have any eggs on hand, so I made this loaf vegan (no eggs/no butter); using vegan cream cheese to make sure that it came out moist. If you don't have any of that on hand you can either sub for a non dairy sour cream or your favorite greek yogurt in equal parts. (see notes). I added in some fresh lemon, ginger, cinnamon and nutmeg and it came out so flavorful. Once you mix all of the dry ingredients with the wet ingredients you simply fold in the blueberries carefully and then bake in the oven for about an hour. The middle came out pretty dense and the edges were crispy. I used frozen blueberries for this, so the bread was a bit wet in the middle and had to be cooked longer than an hour, but I suggest thawing out the blueberries first to get rid of the extra moisture OR simply using fresh blueberries! Immediately when it was finished baking in the oven, I sprinkled a little coconut sugar and cinnamon on top! One trick that I learned to make the edges crispy (even the sides!) is to coat your dish with a non stick spray or coconut oil and then add in coconut sugar straight to the pan coating all sides. ANY BREAD TASTES SO GOOD THAT WAY! You can leave out the lemon if you prefer and sub any non dairy milk of choice! Feel free to add in chopped nuts or even sprinkle oats on top! 1. Preheat your oven to 375 degrees and line a 9x9 baking dish with parchment paper. Set aside. 2. In a large bowl combine the almond milk, vegan cream cheese, vanilla, coconut oil, and lemon juice. Mix until well incorporated. 3. In a separate bowl combine the remaining ingredients except the blueberries. 4. Add the wet ingredients to the dry ingredients and mix until fully incorporated. 5. Using a wooden spoon or spoon carefully incorporate the blueberries into the mix; do not over mix. 6. Pour the batter into the prepared dish and bake at 375 degrees for about 50 minutes. Check, if a knife comes out clean once poked in the middle, it is done, if not bake for an additional 5-10 or until knife is clean when testing! Allow the blueberry bread to cool completely, then slice! Lasts up to a week in fridge! 2. If you are not using a vegan cream cheese, you can replace that with the same measurements of EITHER non dairy greek style yogurt OR non dairy sour cream. 3. You can sub coconut oil for olive oil. 4. If you are using frozen blueberries, the bread will be more dense and will need to be baked for longer. I suggest using fresh blueberries or allowing them to completely thaw out to reduce a bit of the moisture. 5. Any berries will work if you do not like blueberries! 6. Store in the fridge for up to a week! 7. I haven't tested any other flours, but oat flour would be a good sub. If you are using coconut flour you may need more liquid and almond flour will result in a dense loaf. a hearty chocolate peanut butter banana bread for breakfast or snacking! Completely dairy free and gluten free, but super light and moist! Chocolate Peanut Butter Banana Bread! One bowl, few ingredients; to give you a naturally sweet & lightly salty banana bread that is of course dairy free and gluten free! Can you believe that I actually only like bananas in the form of banana bread or in my smoothies? I hate the taste of them alone! Same goes with chocolate, I prefer it to be bitter and dark versus sweet tasting. So, for this I used cacao powder since it is bitter tasting, full of antioxidants, and contains no sugar! The ripe bananas and the touch of honey that I used in the recipe already give the bread a natural sweetness, so I didn't want it to be too sweet with regular chocolate. 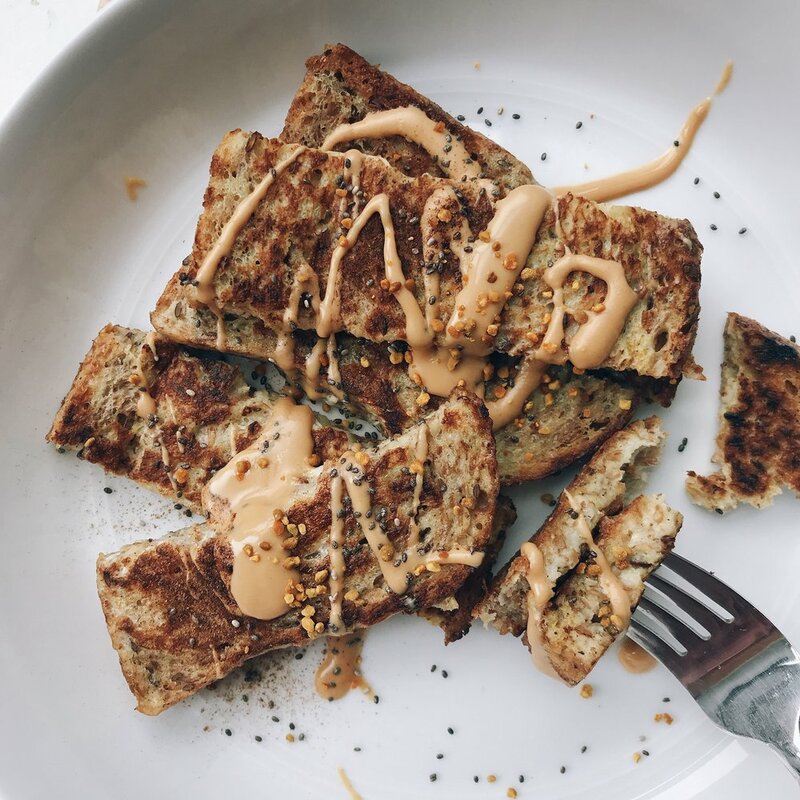 To start you need a few ripe bananas and a few other ingredients that you probably already have; peanut butter, eggs, almond flour, vanilla, honey, cinnamon and just your blender or one bowl! To give the bread a little crunch, I added in chopped walnuts but you can always sub that out for anything else or even chocolate chips! From start to finish it will take you about an hour, but it is very simple to prepare! I usually under-bake my banana breads slightly because I *love* when the middle of each slice is still a little gooey with crispy edges. Usually I would suggest waiting about an hour before slicing a few pieces, but I can never help myself. Sometimes it will crumble apart a bit if you slice it too early but if you aren't serving it to anyone, does it matter?! I also usually keep mine in the fridge or will keep it on the counter top if I know that I will finish it within a few days. Either way is fine, but try to cut one slice at a time to prevent the other slices from becoming stale! I haven't tried any subs such as a flax/chia egg for eggs, but maple syrup will work instead of honey and you can of course sub any nut/seed butter of choice! I hope you like this chocolate peanut butter banana bread that is perfect for any time of the day or night! I usually smear a little peanut butter on top with sprinkled chia seeds or almond milk cream and of course just plain either heated up or cold! It isn't overly sweet, but has the perfect amount of banana flavor, it is a little nutty, and a has a touch of chocolate flavor! You can also check out my recipe; Maca Almond Banana Bread (it is completely flourless!) or my Banana Bread Muffins! optional add ins: dairy free chocolate chips, chopped dates, chopped bananas etc. 2. Either add everything to your blender or one bowl EXCEPT for the walnuts and any additional add ins. Mix until well incorporated. 3. Once mixed, add in the walnuts and anything else of your liking. Mix slowly or by hand. 4. Add the batter to the prepared baking dish and bake at 350 degrees for about 40 minutes. Check the bread after 35 minutes by sticking a knife in the middle. If nothing comes on the knife, it is done! IF the knife isn't clear bake for an addition 5-10 minutes. Let the banana bread cool for 30 minutes to one hour before slicing! Will last up to a week! 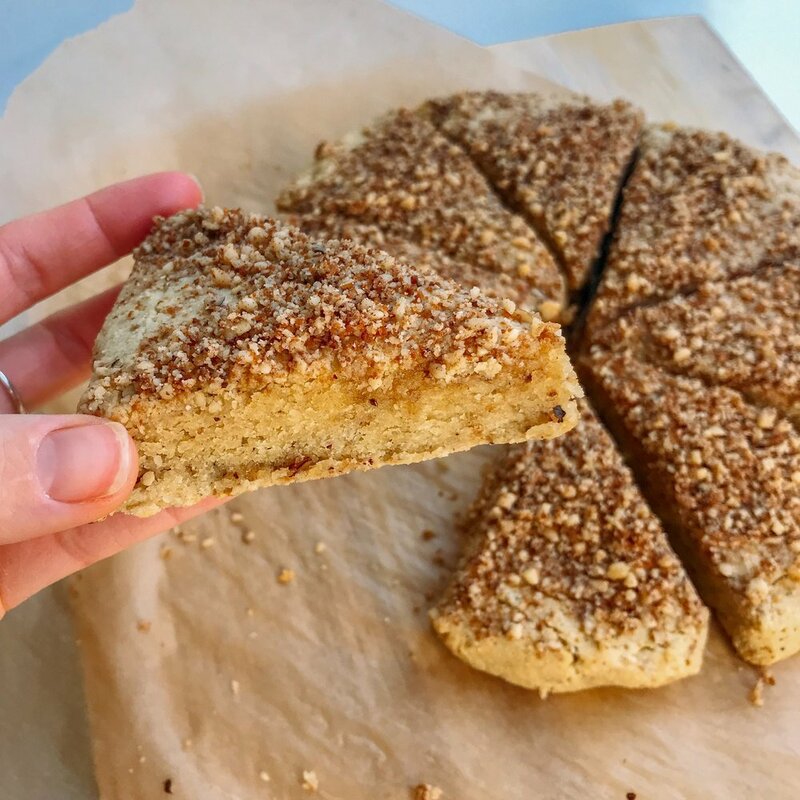 A super simple oatmeal bake filled with collagen, anti-inflammatory agents and gut friendly ingredients that'll keep you satisfied all morning. It seriously tastes like brownies! Typically for breakfast I’ll either have a smoothie, a few energy bites, or pick at leftover veggies from the day before with tahini. I am usually not hungry when I first wake up and tend to wait till mid morning to eat, while sometimes that might not always be ideal, I then often need food that I can take on the go or make ahead of time that will last for a few days! Secondly, I always want to make sure that it is packed with gut and brain healthy/ friendly ingredients; such as fiber, protein, contain anti-inflammatory agents, antioxidants, boost my mood, healthy fats, and last but not least- collagen; an ingredient that seems to do it all these days! This way, even if I am taking something small with me on the go or having a light snack mid morning, I know that it is packed with benefits that will keep my body fueled and properly nourished until I work up an appetite! I wanted to use ingredients that are good for you; really good for you: I filled it with turmeric, ginger, maca powder, raw cacao, cinnamon, ground flaxseed and Vital Proteins Marine Collagen. We all know that the ones mentioned before the collagen can each separately help with inflammation, balancing hormones, boost your mood, help with digestion, contain omega 3’s, contain antioxidants, give you energy, balance your blood sugar levels, and so much more! So, what about the collagen? I have a few recipes throughout my blog using the collagen and usually add the collagen into my daily smoothies, my baked goods (cookies, breads, desserts), chia puddings, and really just about anything you can think of! One of the best part about the collagen is that it is completely flavorless. Even if you add it to your morning coffee or latte, I promise you, you will not taste a think but will reap it’s benefits while you are sipping! The Marine Collagen is great for anyone that does not include meat in their diets or simply stays away from beef! However, for this recipe and anything else, their grass feed Collagen Peptides works interchangeably. Why collagen: On the Vital Proteins website, you can see the major benefits of the collagen listed here, but for starters; you all know that I suffer from major digestive issues such as SIBO, leaky gut, and IBS. Since I’ve started to incorporate collagen into my diet for the last two years, even just a few times a week, I’ve noticed major changes! Not only is it great for gut health because it helps repair damaged intestinal lining and restores the health of your gut! This is why I am so obsessed with drinking bone broth; which side note, they now have bone broth to-go packets! So you can essentially heat up water and pour one it and drink up! Another major changed that I noticed once I started to incorporate collagen into my routine was the growth of my hair and nails. My hair was becoming longer and my skins were too; as well as stronger! My skin was even glowing! It is also packed with protein, so adding it to this oatmeal bake was an easy decision! Also! I decided to make a bake around the 4th of July holiday theme since it is only a few days away! Since many of us travel, it is such an easy breakfast to make for family or friends. It is super quick to prepare and only takes about 30 minutes in the oven and you can really add in anything you want. Going with the theme, I topped it with fresh blueberries and strawberries and this amazing cashew cream that had just a hint of sweetness! The cashew cream reminds me of the inside of an Oreo cookie and since this oatmeal bake is primarily chocolate; it feels like you are eating a brownie; yet it so so GOOD FOR YOU! *Note: you can omit the ginger + turmeric if you wish or add less of each! Total time: Soaking time + 5 minutes to blend together. First prepare the cashew cream by soaking the cashews for at least 4 hours or overnight. Drain and rinse them with clean water after they have soaked. Add them to a food processor with water, maple syrup (start with 1 tbsp first), sea salt, vanilla, and cinnamon. Pulse for 1-2 mins, until well mixed. The spread should be very creamy and smooth in texture. If not, add more water (start with 1 tbsp at a time). Taste test at this point and adjust to preference with either more sweetener, cinnamon, sea salt, vanilla etc! Preheat the oven at 350 degrees and grease your cast iron pan with coconut oil. If you do not have a cast iron use a 9x13 oven safe pan and either grease with oil or line with parchment paper. Pour into your pan and bake at 350 degrees for 30 minutes. The edges will be crispy and the middle with be soft to touch. I did not add any sweetener into the oatmeal bake because of the cashew cream spread on top, which contains maple syrup. This had more a rich chocolate taste. Note, that most of my recipes contain no sweeteners, therefore if you are used to things on the sweeter side or added in maple syrup etc, I would add in 1-2 tbsp. of liquid sweetener of choice. The first time I baked it for 35 minutes and then the second time I baked it for 30 minutes. I preferred it cooked less because oatmeal tends to become a little on the drier side when you bake it. Therefore, I would either bake it LESS OR add more liquid. It will last up to 5 days in the fridge. You can make this the day before. Any leftovers can be used on cupcakes, other desserts, breads, toast, mousse, cakes, dipped in fruit, etc! 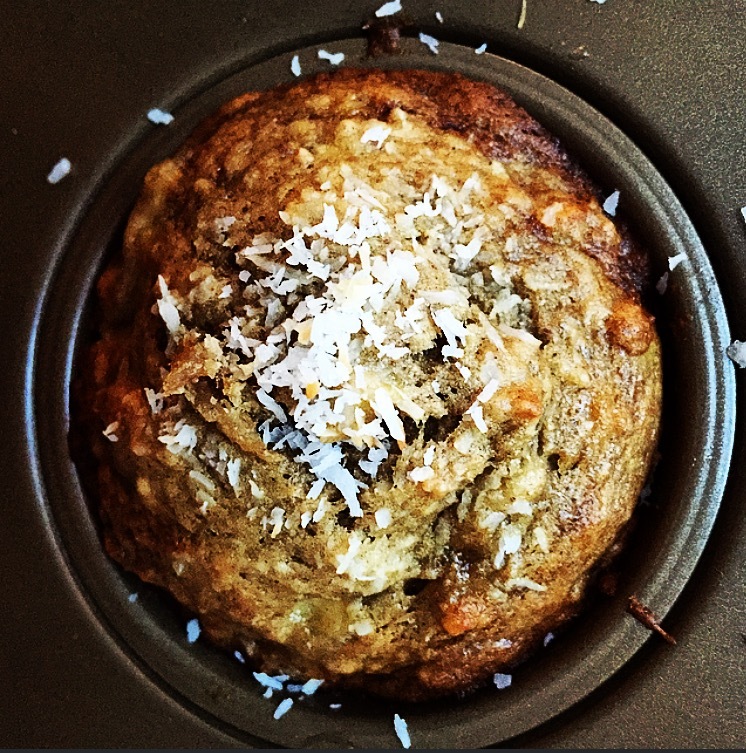 You can also top this bake with peanut butter or almond butter etc! It still tastes so good, but I love it with the cashew cream because it is just something different! Plus the cashew cream stays fresh for about 5 days! I drink a turmeric almond milk latte, a lot. At least once a day if not more, so I am surprised that I have never put the recipe on here. Whenever I post about it on my instagram or stories, many of you ask for the recipe, what it tastes like, what are the benefits, if I like it (?? ), etc. So I am going to share it all here. I love this drink in the evenings before I head to bed. It is so relaxing, soothing on the digestion, and makes me feel calm before I head off to sleep. I also drink this because of the benefits that it has. It just makes me feel good. It was a spicy earthy peppery flavor to it but you can add a touch of sweetness to it to balance everything out, or if you are used to the taste, like me, I tend to never add it honey, dates, or even maple syrup. It can be a spice that takes some time getting used to. Turmeric is known as the "healing spice" and I tend to use it in almost everything that I make. Just a few dashes and thats it! Since I have many digestive issues, this is the one warming drink that actually soothes my stomach. It is loaded with anti-inflammatory properties and antioxidants. It can help with IBS/IBD (inflammatory bowl syndrome/disease), fighting inflammation, improve certain cancers, alleviate pain, improve diabetes and so much more. I highly recommend this spice and to get yourself familiar with it. Start by adding just a little to your savory dishes and then add more and more! This turmeric milk makes my stomach feel less bloated and eases any pain that I may be experiencing (cramps, bloating, nausea, stomachache, etc) and it also helps me settle down after a day or work or late night working out. You will love it! *If you are new to this type of drink, I would just start off with a few dashes of each: turmeric, ginger, and the cinnamon. As it begins to heat up, taste test and add more if needed! Over medium to low heat add all of the above ingredients. Let it simmer for 15 or so minutes. Serve immediately and finish off with a dash or two of cinnamon. The longer you let the turmeric milk simmer, the stronger the flavor will be. However, heating it for a few minutes (5 minutes) until it becomes hot, is completely fine. If you aren't used to the taste I suggest adding in honey or maple syrup then each time you make it add less and less. You can also add in 1 date, then blend it in your blender once it has heated! I love adding coconut oil or coconut butter for not only taste wise, but to make it a little more filling and adding in healthy fats. If you are using a sweetened milk, I suggest not to add in the extra sweetener. You can also serve this over ice once it has cooled a bit. A simple protein & veggie packed make ahead breakfast for the week in under 20 minutes. Each week I get hooked on a new breakfast and then overeat it until I get sick of it and move on to the next thing. Anyone else guilty of doing that? I get so addicted to one thing and can't stop! I always need something quick, pretty simple to make, healthy and filling. In order to save a little bit of time in the morning I like to plan a few meals ahead of time, especially breakfast and make a few bit batches on Sunday, whether it be chia puddings, oats, yogurt bowls, smoothies etc. This week was these simple egg muffin cups. They aren't anything new and you've all seen them floating around, but they are so addicting and kind of fun to make! Also, prep time is so minimal and you are set for the week with breakfast or a healthy protein filled snack. Each muffin cup can be filled with different ingredients and spices too so you won't be bored each morning when you grab one on your way out the door. All you have to do is crack how many ever eggs in a bowl (egg whites work too) fill the bowl with your favorite veggies (meat if you're feeling that), any spices you want, grease a muffin tin with coconut oil and pop them in the oven for about 20 minutes. Done. How easy is that? 2. Crack the eggs into a large mix bowl and mix. Side note here: You can either, quickly cook the zucchini and the onions over the stove top on medium heat in a sauce pan before placing them in the egg mixture or add them raw. They will cook a bit in the oven, personal preference. I didn't the first time and they were tender. IF you are adding meat (sausage, bacon etc) to the egg muffins, you will need to cook before!! 3. Add the veggies and the spices to the egg mixture and mix until well incorporated. 4. Distribute evenly into the muffin tins and bake for 20-25 minutes at 350 degrees. Let them cool before removing. Store them in the fridge and to re-heat place under the broiler for a few minutes or heat the oven to 400 degrees and place them in the oven for a few minutes until warm. I like to serve them with avocado, salsa or on top of toast. Pizza egg muffins: cherry tomatoes, basil leaves, cheese of choice, spinach, sea salt, pepper, eggs. Kale & Chive: kale leaves, ham, chives, cheese of choice, onions, red peppers, pepper, sea salt, eggs. Traditional: bacon, cheese of choice, sea salt, pepper, eggs, onions, spinach. This recipe for two ingredient pancakes is all over google, so you are probably thinking, okay, B, how original. Listen up, these are good and don't make you feel like you need to go take the biggest nap of your life. I've always wanted to give them a try because one, it really doesn't get any lazier than mixing together two eggs and 1 banana to get pancakes in less than 5 minutes, two, they are healthy- no added sugar! ....and that is really all I have ....there really isn't an excuse for not making these pancakes. Clean up is minimal, you can add anything you want into the batter- peanut butter, cacao powder (like I did above), vanilla extract, protein powder...the world is your oyster. So, essentially you can make yourself a different batch of pancakes every single time you make these without having to really whip out more than 10 ingredients on a Sunday, because who really wants to do that? Sunday = day of rest. I've been making these pancakes on Sundays and leaving them in the fridge for the week and in the morning just popping them in the oven to heat them up while I get ready for work....so it is as Sunday morning is happening every single morning and I can forget that I have to be out the door and off to work. I recommend adding the baking powder to the pancakes because it makes them fluffier! It is just a small amount but it does make a difference! I also love adding my favorite protein into the mix or nut butter to create a hearty pancake and it keeps me fuller longer. I blended the batter in my vitamix to make sure everything was nice and smooth. If you don't have one, no worries! Just make sure the batter is clump-free! I used cooking spray (chosen foods, avocado oil spray) and carefully flipped the pancake after 1 minute of cooking on each side. One minute, one side, thats it! Flip them carefully! Top them with whatever you want. Go crazy! 1. Mash the banana with the eggs. I used my vitamix to ensure a smooth batter. Here, add in any spices, baking soda, protein powders etc. (Anything that is smooth). 2. Heat a non-stick skillet with oil, I used an avocado spray and found that to be easier than liquid oil. Once the pan is heated, turn the temperature to medium to low. 3. Add 2 tbsp. of the batter into the pan and let it cook for about 1 minute. Here, add chocolate chips, fruit, nuts etc. Carefully flip the pancakes and cook on the other side for another minute. 4. Repeat step three. I lightly sprayed the skillet each time I added a pancake. 5. Serve warm, freeze them or keep them in the fridge for grab and go during the week! This banana bread is loaded with so many good for you type of ingredients: maca powder, sprouted almonds, apple cider vinegar, and collagen (say what?! we will get to that in a second) but made with less than 10 ingredients and will take you about 10 minutes to prepare. Your body will be thanking you while you are eating it! 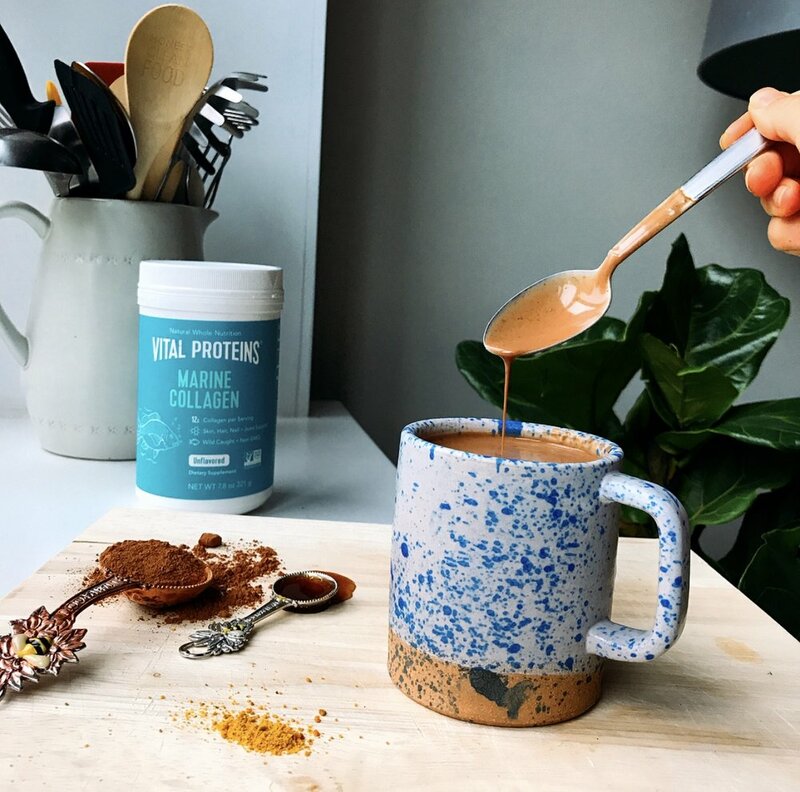 It is so light, fluffy, a little nutty from the almond butter, has a hint of vanilla & caramel from the magical superfood maca powder (which I've recently been obsessed with) and did I mention it is entirely flourless? I always have this go to banana bread recipe that I have been making for years, but I wanted to test my luck with a flourless one by using just organic eggs, bananas and a nut butter as the base. I love one that is very light, not overly sweet, and slightly undercooked in the middle. I mean, the middle piece is always the best part! If I had my way I would only eat the top half. I decided to use almond butter because I thought it would go so well with the sweet and butterscotch or caramel like flavor of the maca powder. Recently, I have been adding maca powder into EVERYTHING I have been eating...oatmeals, baked goods, energy bites, my coffee, seriously anything. It is so good for you and gives you a natural energy boost, helps to balance out your hormones, and increase your endurance. Ok, but one of my favorite additions that I added to the recipe was the collagen and now you're probably wondering why I also added collagen to the bread and what the heck it is?! If you have been following me from day one or read my about me section, you know that I am seriously into gut health since I suffer from so many digestive issues. Over the winter I started making and drinking my own bone broth (don't knock it before you try it!) because of all the benefits that collagen has in healing the stomach. (Think- if you suffer from SIBO or Leaky gut, like me!) I swear it made a huge difference in the way that I felt and was on a first name basis with the butcher, I was seriously like the bone collector all over Boston. Everyone made fun of me but honestly it works and I have collagen to thank! Anyways, now, that it is summer and the weather is warmer, the last thing that I want to be doing is drinking boiling hot broth, so I have been adding Vital Proteins Collagen Peptides to my diet daily so I can stick with my winter routine. It easily mixes into most hot and cold drinks and it is tasteless! Also, just 2 scoops will give you 18 grams of protein so I love adding it to my smoothies, chia puddings, or coffee in the morning, especially after an intense workout for an extra protein boost plus it is great for your joints and helps lessen inflammation. So not only does collagen soothe and heal the digestive track to improve your digestion but it also gives your hair strength, and helps keep your skin smooth and firm. It is such a win all around and I highly recommend it! So, you can see that this banana bread is filled with all the right goods! It is naturally energizing and heals you from the inside out and it is so delicious! *I used a very smooth almond butter, one that wasn't oily based. * I started off with 1 scoop and made it a second time and used 2 and had the same results, but cooked it for a little lesser time. 1. Preheat the oven to 350 degrees. Either grease a 9inX5in bread loaf with coconut oil or line with parchment paper (easier clean up!) and set aside. 2. Add the above ingredients to your vitamix or a mixer and blend! 3. Pour the ingredients into your prepared pan and sprinkle extra almonds on top if you wish! 4. Bake at 350 degrees for 50 minutes to 1 hour. I checked after 40 minutes, then 50 minutes and left it in there for a total of 55 minutes. Store in fridge for up to 1 week or freeze for longer! When I was younger I loved eating "toad-in-a-holes." for breakfast. It was such an easy and simple breakfast but something about the crispy buttery bread and the runny yolk was so satisfying! I like to think that this recipe is the grown up version of your ordinary toast with an egg cooked in the cutout center. The natural sweetness of the acorn squash paired with the richness of the yolk makes it the perfect balance to satisfy all of your cravings. The hardest part of the dish will be cutting the acorn squash into slices. You'll need a steady hand and a really good knife. If anyone has any tips for cutting squash without the fear of losing your fingers, I'd love to know!! This recipe calls for just a few spices making it more on the savory side, but if you want to sweeten the acorn squash with the cooked egg you could use a little coconut sugar or maple syrup before you bake the vegetable. I think that the squash is already naturally sweeten and doesn't need the added sugar but of course it would still taste result in a soft flavorful squash! Since you have multiple acorn squash rings you could always get a little creative and use different spices and herbs on each one- perfect for the indecisive mind! This is one of my new favorite ways to eat acorn squash and it was even better than what I hoped for! After the acorn squash was finished baking in the oven with the cracked egg I finished the slices off with chopped parsley and a few pinches of sea salt. I ate mine without the skin as it can be a little tough but it does give each bite a little more crunch and texture! The baked acorn squash egg-in-a-hole makes the perfect brunch on a lazy weekend paired hash browns, crispy potatoes, or bacon! If you are short on time, you can always bake the acorn squash slices the night before and in the morning you can re-heat the squash with a fresh egg cracked in the center. It'll be ready in less than ten minutes! Or, if you are anything like me, and love breakfast foods for all meals, you could have this for a weeknight meal that can be ready in less than 30 minutes. 1. Preheat the oven to 425 degrees and line a baking sheet with parchment paper. 2. Trim the ends of the acorn squash off. (Both sides, about 1/2 inch thick). 3. Slice the remaining part of the acorn squash crosswise into 4 uniform slices. Remove the seeds and the middle part of the squash. 4. Place the slices on the parchment paper and brush both sides with olive oil, sea salt, pepper, paprika, and turmeric. Bake at 425 degrees for 15 minutes or until tender with a fork. 5. Remove the baking sheet from the oven after 15 minutes and crack an egg in the center of the squash. Sprinkle with sea salt and pepper. Place the baking sheet in the oven and bake at 350 degrees for 8 minutes or until the eggs are cooked you desire. Garnish with chopped parsley and additional seasoning if needed. Serve immediately. Toasted coconut. Roasted almonds. Melting chocolate. For breakfast? Yes! I almost feel guilty calling this breakfast because it tastes like a dessert. Each bite of this baked oatmeal reminded me of those almond joy / mounds candy bar that I used to eat when I was a child but obviously healthier! To me, chocolate and almonds are a match made in heaven. Once I open a bag of chocolate chips and a bag of almonds, mix it in a bowl, it's all downhill after that. It's too addicting! I wanted to incorporate both the nuts and the chocolate in a breakfast dish but also wanted to add another element. So, I decided to use unsweetened coconut flakes. I personally think coconut flakes are a perfect addition to any baked goods or right out of the bag. I wanted to deepen the coconut flavor before adding the flakes to the mix. Toasting will do exactly this! A rich nutty flavor develops as the coconut flakes bake in the oven for just a few minutes and gives them a crispier texture. I knew this would pair well with the chocolate and almonds. I have to praise my girl Rach and one of my favorite foodie friends to follow on Instagram for reintroducing me to baked oats. Oats are her language and I swear bakes all things oats faster than anyone I know. Which, I am not mad about! I honestly love how versatile and easy making baked oats are. You can prepare a baked oatmeal dish on a Sunday and have it the rest of the week for breakfast or snack. I mean you can seriously roll out of bed at the last minute, open the fridge and grab a slice. One of the great things about this? You will never get sick of them! Once you establish a base you can really add any ingredients you want to create exactly what you are craving- chocolate...fruity...nutty...you get the idea! For this recipe I decided to double the amount of oats that I usually use and added eggs to the mixture. It resulted in such a thick, fluffy and cake-y texture once the oatmeal mix was completely baked. It makes for such a hearty and delicious breakfast treat in the morning especially with a cup of coffee. Am I the only one that loves chocolate and coffee together? The richness of the chocolate paired with the almonds and the toasted coconut also make it the perfect (& healthy!) after dinner sweet tooth fix- just reheat a slice in the oven and after a few minutes you'll end up with warm, gooey, chocolatey bites of perfection! Prep: 15 mins. Cook time: 45 mins. **If you don’t have this flavor, you can really use 1 cup of any nut butter you prefer or simply omit it all together! Preheat the oven to 325 degrees. Grease a 9x13 inch baking dish with coconut oil and set aside. On a baking sheet spread out the coconut flakes evenly on one side. Pulse 1 cup of the almonds in a food processor a few times. Add to the other side of the baking sheet with the coconut flakes. Bake in the oven for 5 to 7 minutes. The coconut flakes will begin to brown, crisp, and develop a caramel color. Once the coconut flakes and almonds are finished set aside to allow them to cool. In a large bowl mix together the gluten free oats, chia seeds, cinnamon, baking powder, sea salt and half of the chocolate chips. Set aside. In a separate bowl mix together the eggs, almond milk or coconut milk, coconut oil, and the vanilla. Add half of the coconut flakes and half of the chopped toasted almonds to the dry mix. Add the remaining almonds that were not chopped to the dry mix as well. Pour the wet ingredients over the dry ingredients. Add the almond butters to mix. Heating the nut butters makes it easier to mix in the bowl. Pour the batter into the greased pan and spread evenly. Sprinkle the remaining coconut flakes, chopped almonds, and the chocolate chips over the oat mix. Optional: sprinkle with coconut sugar. Bake in the oven at 350 degrees for 40 to 45 minutes. For an extra crunchy topping, you can broil the oatmeal for the last few minutes. Serve warm! I love adding a scoop of dairy free yogurt, almond milk, or one of my favorite spreads; hazelnut raw cacao over the baked oats! I love pizza and crave it often, but always struggle finding the best dairy free pizza. To me, the cheese is probably what makes or breaks the pizza and honestly most dairy free cheses are terrible to say the least. Unfortunately, I think that a pizza needs that ooey-gooeyness, other wise it is completly dry! Over the weekend, my craving for pizza hit hard around breakfast. I knew I needed to create an alternative that was satisfying and big on flavor! To reach that level of "ooey-gooeyness" I decided to crack an egg on top of the pita. The runnyness of the egg and the richness of the yolk pairs perfectly with the spinach and the crunchy pita! It was so hard to not want to make another one, when I was soaking up the last bit of the runny yolk in the crispy, salty, pita. Cooking the spinach in coconut oil was definitely the best decision I could have made. It added a tremendous amount of flavor to the spinach without having to add any spices to the veggie! The great thing about this simple pizza is that it calls for ingredients that you probably always have in your refrigerator and can be ready within 20 minutes. Cheese, avocados, extra vegetables, etc! Preheat oven to 425 dgrees. In skillet, heat coocnut oil over medium heat. Add the baby spinach, sea salt and pepper and cook until wilted. About 3 minutes. Set aside. Line a baking sheet with parchment paper, add the cherry tomatoes and the pita. Drizzle the tomatoes with a small amount of either coconut oil or olive oil. Spread 1 1/2 tbsp. of desired sauce. Make sure you do not add too much sauce of the middle of the pita will become soggy. Top the pita with the cooked spinach (+any extra topping of choice). Make a small well in the center and add the cracked egg- gently. Sprinkle with sea salt and cracked pepper to taste. Bake until the egg whites are set but the yolk is runny. Roughly 8-10 minutes. Serve! I am slightly obsessed with banana bread and banana bread muffins. I feel that I am constantly buying bananas and impatiently waiting for them to become the perfect amount of "freckled" to ensure a sweet, moist, and fluffy muffin. I could never understand why someone would throw the banana out when it has reached that level...ok, I get it, maybe because of the fruit flies, but still- you are only a few steps away from having the most perfect side with your morning coffee or tea. I usually make banana bread but this time around I wanted to change things up in the kitchen. Instead of the only 1 flavor throughout the loaf, I wanted to experiment with a few different ones. That way, I would never get bored and they will satisfy anyone's taste buds. The only hard part, is deciding which one to eat first. walnut, the OG (original), shredded coconut, and chocolate chip. Feel free to get creative in the kitchen! I am sure adding a little peanut butter or chia seeds would work great! [Side notes: Regular butter would work. I often bake with coconut sugar, but did not try it with this recipe. If anyone does, please share! However, I always stay away from white sugars. Preheat the oven to 350 degrees. Grease the muffin tins with the butter. Set aside. In a mixing bowl, mix together the bananas and the melted butter, until somewhat combined. There may be a few banana lumps & that is OK.
Next, mix in the brown sugar, egg or replacement, and vanilla. Mix until combined. Add the cinnamon, nutmeg, baking soda, baking powder, and salt. Mix with wooden spoon. You want to be careful that you are not over mixing the dough. Once combined, add the flour. Mix with a wooden spoon until just incorporated. Be careful to not over mix. Once again, it is OK if there are small banana lumps present in the batter. Fill the muffin tin with the mixture. I filled mine almost to the top. At this point you are done! However, if you want to change the flavor of the muffins, this is where you can add in your desired toppings. In sets of three, I added a few dark chocolate chips, unsweetened shredded coconut, walnuts, and kept the last set of three plain. Bake the muffins for 15 minutes. Check on the muffins and if the knife is not completely clean, bake for another 5 minutes. I baked them for a total of 20 minutes. IF, you want to bake into a bread, I would suggest using the standard 9x13 pan and bake for 50 minutes or until a tester comes out clean.